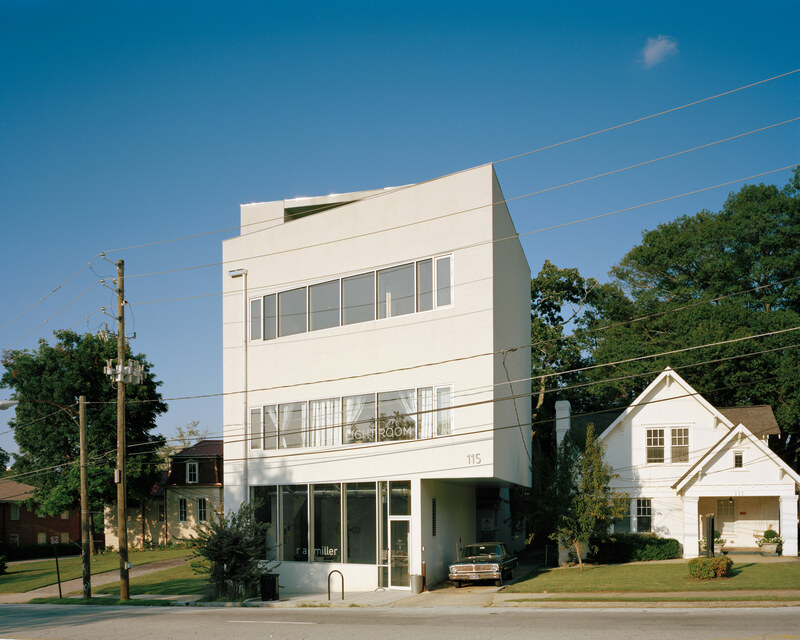 Architect William Carpenter, glimpsed in his second-floor design studio, built Lightroom 2.0 to sit unobtrusively among its 1920s neighbors in Decatur. New zoning allowed for a zero-lot-line structure, but required a public storefront, which Carpenter uses as an art gallery. Lightroom 2.0 was inspired by artists’ lofts and Decatur’s industrial past. The gallery floors are polished concrete and the exposed joists are Georgia-Pacific engineered lumber. In the living quarters of Lightroom 2.0, Carpenter’s daughter Esme chats with her boyfriend, who is seated on a Milo Baughman Case Sofa. Carpenter kicks back on an IKEA outdoor sectional on the sealed-pine roof deck of Lightroom 2.0. A collection of vintage Tulip armchairs by Eero Saarinen surround a “Jetsons-inspired” fireplace from the 1970s found online. A new Lightroom exhibit by multimedia artist Bojana Ginn is set to open at the end of January 2016. Here, a three-channel video installation reinterprets the act of drawing through a new medium. Long before he became an architect, William Carpenter was obsessed with the relationship between buildings and the larger environments they occupied. For Carpenter, a building is but an object without the context that surrounds it. “It’s really a neighborhood’s history and landscape that give buildings their significance,” he says. Situated between downtown’s tourist-heavy Decatur Square and the quiet, more residential Oakhurst community southwest of town, Lightroom 2.0’s location makes it a prime place for neighbors to gather, just as Carpenter intended. The architect took advantage of Decatur’s updated zoning laws, which favor more pedestrian-friendly design standards, such as storefront spaces that come right up to the street. 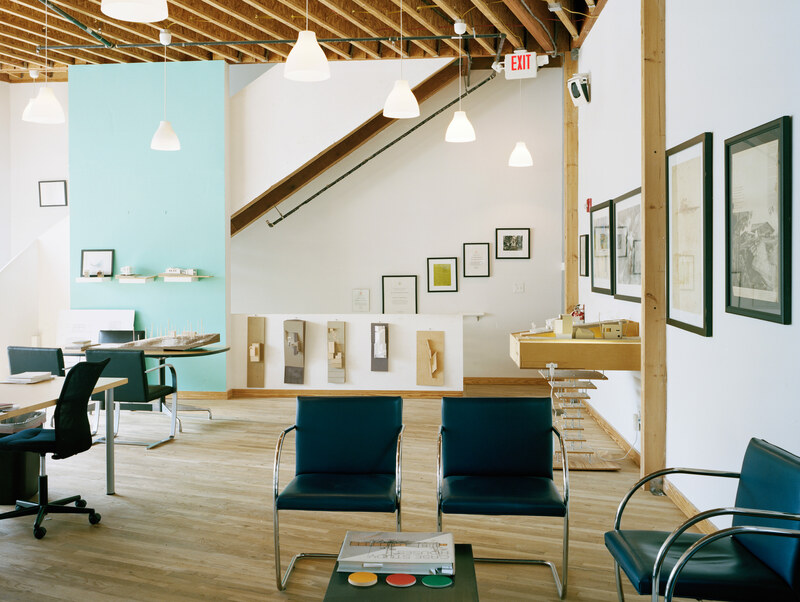 The gallery has public openings and is designed to look like an artist’s loft, with concrete floors, large windows, and exposed engineered-wood joists. It routinely features the work of local artists, including Bojana Ginn, who projected videos about the use of light in architecture on the building’s interior and exterior walls as part of a November 2015 exhibition. One floor above the gallery is the studio for Carpenter’s multidisciplinary design practice, Lightroom, which gave the building its name. At first glance, the room looks like a quintessential architect’s office: wood models, dozens of hardcover design books stacked on tables, and framed artwork. But small details offer a glimpse into Carpenter’s appreciation for place and history. A framed poster promoting an exhibition by the late Norman Jaffe hangs on the wall—the architect was a close friend and mentor to Carpenter, who grew up on Long Island, New York, admiring Jaffe’s modern Hamptons homes. Similarly, floors made from utility oak pay homage of a different kind—specifically, to the shipping containers that used to pass through town. The decision to use wood at all is a testament to the design journey Carpenter experienced while creating Lightroom 2.0. He originally envisioned the building as a steel structure but ultimately settled on engineered wood after feeling the fallout of the recent financial collapse—the first bank Carpenter worked with went under during the recession, forcing the architect to reevaluate the budget. William Carpenter worked with Jennifer Martin and Maria Sykes on this project.